"Jolting along a mountain path in a park-keeper's jeep in Argentina's Mendoza State, we are surrounded by a series of beautiful, dry sand-coloured mountain ranges. Pinks and violets, greens and blues emerge from the shadows in the landscape around us. 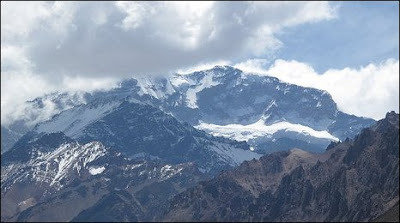 We've come to see South America's highest mountain, Aconcagua, in the park of the same name, which lies just ahead up the valley in full sunlight, its summit wreathed in snow. The mountain, in the Andean range not far from the Chilean border, hit the headlines back in January..........for the full story, visit the BBC News website. "